Every so often, a concept comes along. That seems like pure gold on paper, and in promotions. It builds a lot of hype, that seems damn near impossible to live up to. It creates hesitation for the viewer, due to the fact of being burned by it in the past. When you see the image of a half werewolf, half police officer on the cover. Positioned under the epic title of Wolfcop. That horror nerd inside us all squees with joy. You want so deeply for it to be great. To connect on every level. Wolfcop is thankfully a horror comedy that works. Writer Director Lowell Dean has created a film that is Teen Wolf, Meets Super Troopers by way of Tromaville. The comedic timing is incredible, the gore is great, and equally funny. The werewolf transfomation is highly impressive, and unique in it’s own ways. The storyline, and characters have a very interesting twist to them as well. Not usually seen in this type of throwback style movie. It’s badassery is turned up to eleven, and lived up to the hype from beginning to end. The film also opens up the possibility for sequels. Leaving a feeling of excitement in my goofy horror nerd bones. 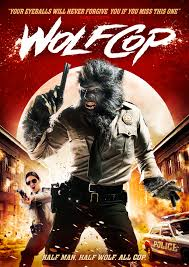 Wolfcop is a badass, funny, gory fun time. It was a blast. And I can’t wait for more.